It was 2011 when I switched to being a full-time blogger. I went in with a open-mind and 5 years later, I'm still doing it. Throughout the years, I noticed there are many great things about blogging, yet there are also the bad. Here are my 10 pros and cons about being a full-time blogger. 1. You get to work your own hours which can be handy. Especially now that I have a little one. I can do a weeks work in 4 days and have the other 3 days off. I get to plan my own time. 2. I'm doing a job I love, not a single day feels like work. 3. My work involves everything I love, make-up, fashion, travelling and so on. Blogging is diverse and I can blog about anything I like. 4. Meeting like-minded people. Many of my friends are not as make-up/fashion crazy as me so when I meet someone who is, it's like meeting a long lost sister. 5. I get to manage my own work and work at my own pace without anyone dictating what or when to do things. 1. Working from home can be lonely. Come Monday mornings, I don't have several colleagues to talk about the weekend, no-one to go for lunch with and definitely no chit chat coffee breaks. It's me and 4 walls. 2. You have to be self motivated and if you're a procastinator like me, it can be a battle. I also don't get 'holidays'. It's hard to switch off... almost impossible. 3. Many don't understand what a blogger actually does, how we make our money and how it's a 'business'. This leads to many patronising questions. 4. There will always be assumptions that working from home means laying in bed all day, always being free and generally not needing to work. Sometimes it's true, but most times it's not. The bills don't magically pay themselves. 5. Being a full-time blogger basically means self-employed. Income is unsteady. Some months are fantastic, some are great and some may be bad. It's unpredictable. This is just my two cents, other bloggers may beg to differ. Overall all though, I love what I do and wouldn't change a thing about it. If you're in doubt whether to start a blog, just do it. You never know where it may lead, there's nothing to lose. You inspire me to start my own beauty blog and YouTube vids! Love you Suzi! I hope one day I can do this, you're my favourite British YouTuber/Blogger! I love what you do and share, keep it up! Love this, so honest! Hope you're well! Agree. I'm a lazy blogger half of the time yet still continue cus I just love it. Interesting post, and it came at the right moment as I just started blogging and posted my first blog post today! 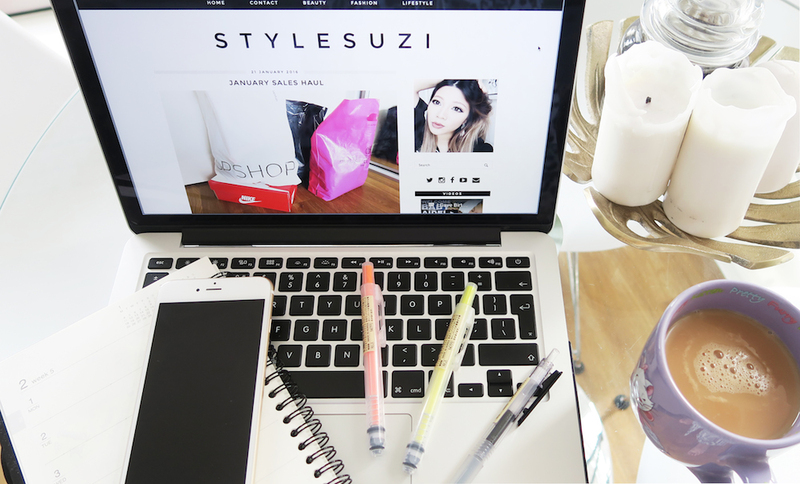 Love your blog and youtube channel Suzi! May I ask who's going to pay you the wages? I'm not a full-time blogger but as a freelancer, I so get you! I think people assume our lives are one giant holiday, but it's actually pretty depressing not having anyone to talk to about your Christmas break or just share a cuppa with at lunch time. Still, it's got its pros too so I can't complain. I think I remember when you switched to blogging full time! I guess I've been following you for that long??? Crazy how time flies! And now you're a mommy! I definitely see the pros and the cons as well. Thanks for the insight of pros and cons of a full time blogger. It's hard for me to transition on being a full time blogger because I have a 8 months year old baby to take care of. I'm a blogger but personal hobbies. I do wish you success to continue you what you enjoy to do and good luck. I agree 100% with you! It's always great to do something you love. The downs can really be a battle, but at least there are some rewarding ups. Especially with things the way they are nowadays. All my best wishes to you and yours. Keep up the great work. be an effective and positive behavioral changes. Smart UK Replica watches Watches Replica that combines the platform self MotionX that is Designer handbags and quantification in order to understand better themselves than now.Frédérique Constant, Alpina and MONDAINE is for handbag replica women and men in 2015 to start the 10 different models of Replica Rolex Watches smart watch.Technology platform of MotionX technology MMT, these major brands, the offers dozens of aaa different models.